At first glance this Blackbird appears very similar to those self-coloured nineteen-thirties pens in the 52– range that I wrote about here http://wp.me/p17T6K-7m. It has the same shape, high-set heat-inserted clip, slight taper and very thin gold on the trim. 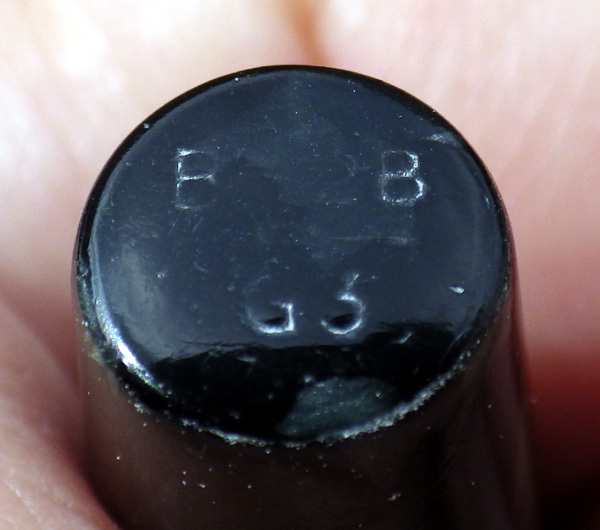 The last vestiges of a model number on the base of the barrel indicate that despite the resemblance, this is in a different range of pens. The upper line might be BB2B. The first and last two characters are visible. The lower line looks like G3, but that fits no system of Mabie Todd numbering that I’m aware of. Then I tried 63 as that looked possible but that number denotes a russet/jade mix. Then I thought – against the evidence of my eyes – that it might be a 6 with a five turned slightly to the right, Neither John’s nor the FPN list show a 65 so it might be that, but I have to say it doesn’t really look like it. How does one define this pattern? There’s a slight colour difference between the cap and the barrel due, no doubt, to a latex sac out-gassing there. There’s some colour shift in the cap too, especially around the site of the inner cap. The least affected part seems to be the lower part of the cap near the cap lip. Here it’s a bluish grey with a paler grey and areas of black. Perhaps another one will turn up with a better model number. These very simple thirties Blackbirds are what we call school pens, though doubtless they were used by many others apart from school pupils. The price was kept down by keeping the trim basic, but the quality is as high as ever. The celluloid is decorative and in this case uncommon and the pen is now, as it was when new, an excellent writer.